Guess the profession of the person to whom these hands belong. Post your answer on Work Stew’s Facebook page or email it to me at kate@workstew.com. I’ll pick one mug winner randomly from all those who submit correct answers within the next 24 hours. Thank you very much to Kathy Bosin for suggesting we play this game and for providing the photo. For a glimpse into Kathy’s (rather idyllic!) world, be sure to check out A Chesapeake Journal, her site about life on Maryland’s Eastern Shore. 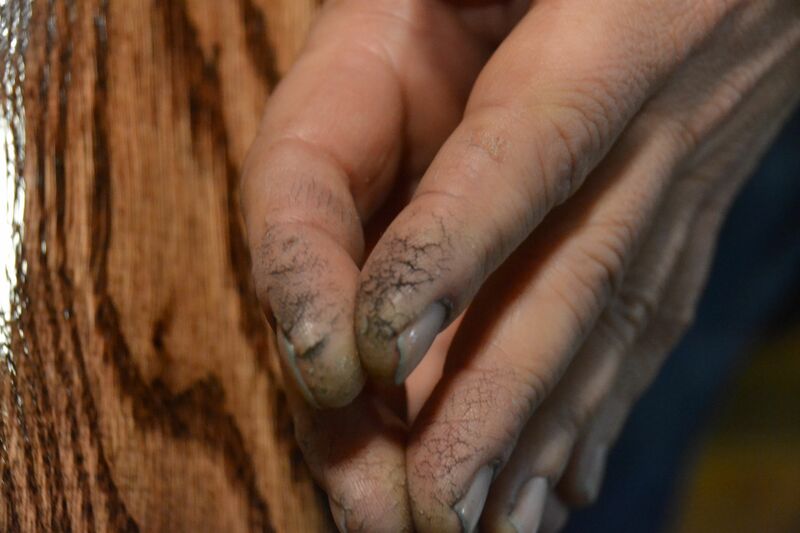 The answer is: those are the hands of a jewelry maker. I received lots of good guesses (via Facebook and email) but none quite on the mark. Thanks for playing, one and all. Anyone else have an interesting work photo that might lend itself to a good round of ‘Guess the Profession’? If so, send it my way (kate@workstew.com); the provider of any photo used in this way will ALWAYS get a mug. Just a quick note to say that the podcast is on hold for a bit, while I figure out a new schedule that works all around. Work Stew’s Facebook page (which I like to think of as our virtual water cooler) will be maintained as usual, and essay submissions are, as always, very welcome. A former CIA spy does a reality check on the TV show ‘Homeland’—what rings true, what doesn’t, and the scene that made her tear up. A newspaper cartoonist explains what it takes to be funny seven days a week, for more than sixteen years. A husband-and wife team who make their living as long-haul truckers describe their life on the road. The voice in my GPS describes how she got there. Turns out she’s an accomplished singer and songwriter. A particle physicist describes what it’s like to be focused on topics that most of the world knows nothing about. A certified mediator explains why he loves getting involved with other people’s disputes. A comedy writer on the path he travelled to arrive at his role on Comedy Central’s hit show Tosh.O. A long-time flight attendant who recently retired from the airline industry to become…a gorilla caretaker. Seriously. A marketer-turned-cook describes how hard she works, how little she earns—and how much she loves her new career. Why a podcast? Work Stew is a place for people to share their thoughts and stories about their working lives. Essays are one way to do that, and in-depth interviews are another. The hope is to build, over time, a rich collection of distinctive voices, captured in both the written word and the spoken word. Suggestions? New episodes of the Work Stew podcast are released every two weeks. To suggest an interview subject for a future episode, please write to kate@workstew.com.